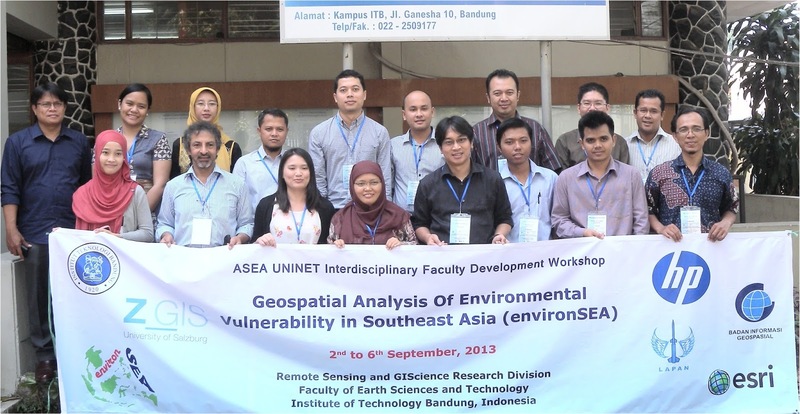 The Interfaculty Department of Geoinformatics - Z_GIS, University of Salzburg, Austria completed a week-long international workshop entitled 'Geospatial Analysis of Environmental Vulnerability in Southeast Asia (environSEA)' from 2nd to 6th September, 2013 in Bandung, Indonesia. It was hosted and co-organised by the Remote Sensing and GIScience Research Group, Faculty of Earth Science & Technology, Institute of Technology Bandung (ITB), Bandung Indonesia and was co-funded by ASEA Uninet, Austria. Dr. Shahnawaz from Z_GIS conducted the workshop assisted by Ms. Riantini Virtriana from ITB. Prof. Ketut Wikantika (Head, RS & GIS) inaugurated the workshop and Prof. Riqqi Akhmad (Head, ISD) presented the certificates of successful completion to workshop participants. Focusing on interdisciplinary faculty development, 18 teachers and graduate students from 12 universities located in 4 countries (i.e. Indonesia, Malaysia, Philippines and Thailand) participated in the workshop. 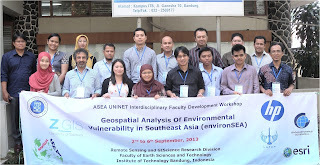 During the workshop, participants developed individual projects covering various aspects of environmental vulnerability in Southeast Asia and performed geospatial analysis using ArcGIS Desktop software.